In our special edition of Timepiece Thursday, this week will be about how Breitling has sponsored a new project that tests the tenacity and commitment of one man to beat the odds. 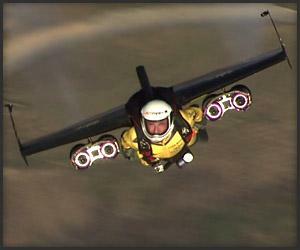 His name is Yves Rossy, more popularly known as “Jetman”. The reason for this nickname is a story all its own, and that is where we are going this week. Jetman flying at high velocity over Rio De Janeiro in early May, 2012. In early May, 2012, he took to the skies over Rio De Janeiro by falling out of a helicopter with a set of wings and four, that’s right, four turbine engines. These miniature jet engines packed a punch by pushing Yves well over 300 mph. Breitling made a bold move to sponsor his flight with newly redesigned wings and turbines. The tests have been ongoing for a while, but the concept is becoming a real masterpiece, just like the Breitling watchmaker. Yves Rossy, ‘Jetman’, takes flight in this video clip. Watch in amazement! 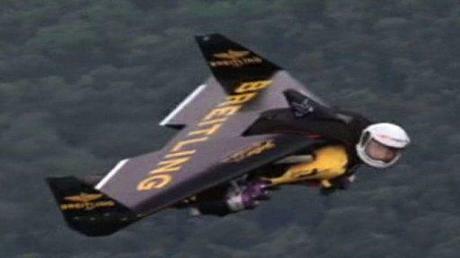 Breitling has been in the aeronautics field for a while with its own team being seen with Jetman during this flight. With a bright yellow parachute hosting the timepiece brand name, the flight came to a conclusion about 11 minutes later. 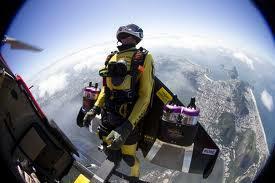 Jetman prepares to fall out of a Breitling helicopter to begin his flight. During this historic event, Rossy flew over Rio and some famous sights to give tourists and Rio residents a real treat. It’s not every day you see a man with high powered turbines and explosive fuel strapped to his back. Thankfully, the flight was a complete success and you can count on this story continuing in the near future with Breitling going along for the ride. Watches are one of our favorite products and at Raymond Lee Jewelers, you will find a fantastic selection of our pre-owned watches displayed in our showroom. Come by our store or visit us online for a shopping experience that is quick and convenient!